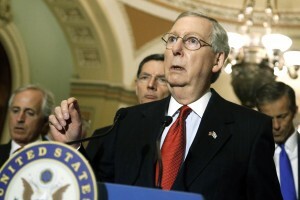 WASHINGTON (AP) — Senate Majority Leader Mitch McConnell on Thursday decided to postpone action on a bill giving Congress a chance to review and vote on any deal the U.S. signs with Iran over its nuclear program. The move comes at a time delicate negotiations are at a critical juncture between the U.S. and its partners and Tehran. Democrats, many of whom backed the legislation, had loudly criticized McConnell for scheduling a Tuesday test vote on the bill. They accused him of playing politics in bypassing the Senate Foreign Relations Committee process and said it was better to move slowly to ensure bipartisan support for the measure. Sen. Bob Menendez, D-N.J., a co-sponsor of the bill, announced that he was so outraged at McConnell’s decision to fast-track the bill that he would vote against moving ahead on the measure on Tuesday. Nine other Democrats said they would join Menendez. Faced with unified Democratic opposition to move ahead on the bill, McConnell reversed course. Sen. Bob Corker, R-Tenn., the Foreign Relations chairman and the main sponsor of the bill, on Wednesday played down McConnell’s action, saying he scheduled the vote for procedural reasons to save legislative time when the measure eventually comes to the Senate floor. On Thursday, though, he too said he was happy for the delay. An aide to Senate Minority Leader Harry Reid, D-Nev., said McConnell moved to bypass committees and bring the bill to the floor unilaterally without consulting Menendez or any of the other Democratic senators working to garner support for the measure. The bill would require President Barack Obama to submit any agreement reached with Tehran to Congress within five days. In addition to the text of the agreement, the bill would require the White House to submit information about Iran’s compliance and a certification that the agreement meets U.S. non-proliferation goals and does not jeopardize U.S. national security, including not allowing Iran to pursue nuclear-related military activities. Moreover, it would prohibit the president from suspending, waiving or easing any congressional sanctions being levied on Iran for 60 days. Obama has threatened to veto the measure. Sen. Chuck Schumer, D-N.Y., said that in trying to rush the vote, McConnell was “injecting politics” into the U.S.-Israeli relationship just as House Speaker John Boehner did by inviting Prime Minister Benjamin Netanyahu to address a joint meeting of Congress earlier this week to warn the U.S. and its partners from signing an agreement with Iran, an archenemy of Israel. “The relationship between the United States and Israel is at its strongest when both parties are working in tandem, and those of us that value that relationship are glad that Leader McConnell backed off,” Schumer said.